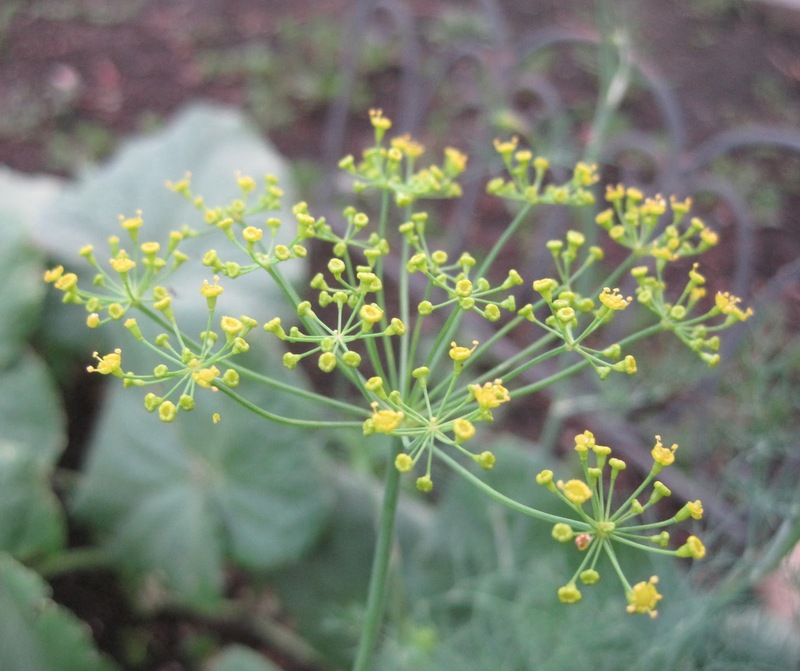 Dill flowers are a favorite of the garden fairies. We are garden fairies and we do not know whether we should take umbrage or take cover. We have had much discussion about this and could not decide so have agreed to put the matter before the good readers of this blog. We are garden fairies and we have received word from reliable, trusted, accurate sources that Carol was presenting to a group about old gardening books and she told everyone that "her garden fairies are lazy". Well, we heard this and then we realized that we are garden fairies and we live here at May Dreams Gardens so that means that two plus two equals Carol thinks we are lazy. We will tell you that certain garden fairies, including the right reverend Hortus Augustus McGarden who regularly presides over the services and final rites for everything in the compost bin was particularly affronted by this as he and his mother, Granny Gus McGarden, work tirelessly on that compost. Ol Rainbow Tanglefly told everyone who was in favor of taking umbrage to simmer it down and that Carol probably said it to try to get us to prove her wrong and to prove her wrong we would all have to do more work around here, so clearly it was a trick to get us to, well, do more work around here. Plus, what is umbrage, anyway? Or should we take cover? Many of us think that what we should really take is cover. Sweetpea Morningglory happened to be minding her own business in the sunroom when she noticed that Carol took the basket of seeds off the counter and started sorting them. Well, it seemed to Sweetpea, and we are garden fairies, that Carol had lots of seeds, but then she proceeded to order more seeds. We are garden fairies and we could not believe how fast she ordered seeds. It was like she bought one of every packet of seed they offered with nary a thought. She was almost gleeful, except for a brief moment when she thought she wasn't going to find 'Green Arrow' pea seeds anywhere. She looked stricken at that point, but she finally did find some and ordered them up straight away. All is right in her world now. We are garden fairies, we think this seed ordering, plus an email we intercepted, are signs that there will be increased activity in the garden this spring. We all remember what happened a few years ago when Carol dug up whole flower beds and people came in and added more flower borders and it wasn't safe for garden fairies what with those shovels and rakes and hoes moving all those plants and dirt so we had to run back to the vegetable garden to take cover for darn near the entire summer. We are just grateful that the McGarden family took us all in. Oh my, the parties we had that summer. Let me tell you, there was this one party... hey wait a minute, is this all some trick to get us to tell more of our secrets? We are garden fairies and we are not telling everything that goes on around here. Most people know too much as it is. We just want folks to know that there is big increase in garden related activity around here which makes us wonder. Take umbrage? Take cover? We need to decide which to take. We are garden fairies, maybe we will take both? Or maybe we will take over? Go ahead and take both ... you can always change your minds. You are garden fairies. Like the Dowager Countess, you can be as contrary as you like! Taking cover sounds like a good plan, since it seems change is afoot. But since you live in a garden, change is always afoot there, so you must be used to it, and Carol's seed fun by now. Umbrage? Carol loves you, have no doubt. Hi Garden Fairies...I think you should take cover and watch all the excitment taking place! Maybe Carol will put in some new places for you to play!